Come to the Capital, Saratoga and Adirondack region’s running, biking, triathlon, paddling, hiking, healthy living and travel show – the sweaty, dirty sports you love all under one roof! 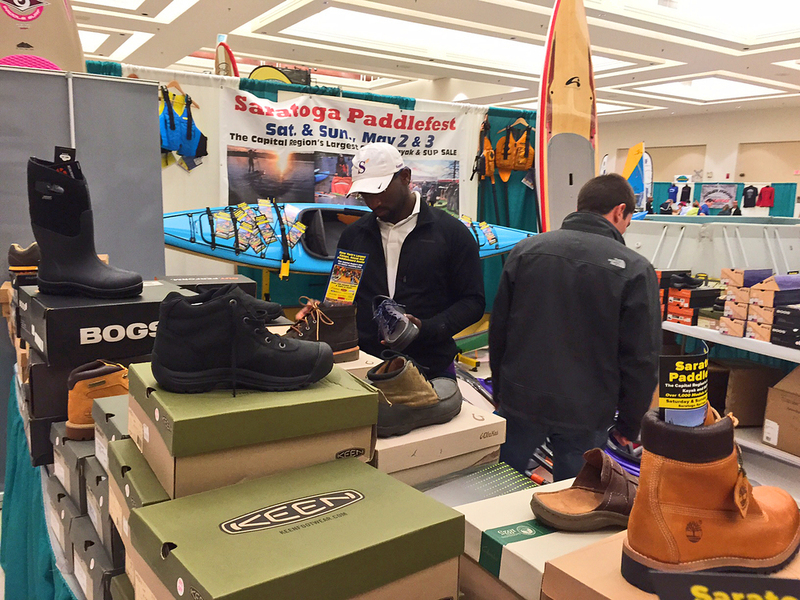 It features 125 exhibitors, great sales on summer/winter gear, clothing, footwear, and on-water demos in the 20x32-foot pool. Plus, seminars, clinics and family activities, including a 25-foot rock wall! The expo will have $10,000 in prizes and giveaways. Door prizes to regional running races, triathlons, hiking packages, weekend lodging getaways, custom orthotics, bike service, health, fitness, scuba training, meal packages, and much more will be given away. And we have 30 new exhibitors at the Expo! The timing of the Summer Expo is perfect for athletes, weekend warriors, enthusiasts and newbies to pick up gear, information and motivation to plan future events, races and adventures. It’s the place to kick-start a fitness program or take your health to the next level. Event reps from Firecracker 4, Tour de Cure, Lake George Triathlon, Freihofer’s Run for Women, Malta 5K, Peak to Brew Relay, Saratoga Springs Half Marathon, Tour of the Battenkill, and Cycle Adirondacks, and many more will be on hand with info and entry specials. The Expo also has great deals from a mix of retailers, organizations, health/fitness professionals, and green living vendors selling and presenting their products and services. This includes Steiner’s Ski & Bike, Mountainman Outdoors, Plaine’s/Collamer House, Fleet Feet Sports, Live Your Life Gear, Huff N Puff, Arbonne and more! Most major outdoor sports and recreation clubs in the area will be represented, including Adirondack Mountain Club, Mohawk-Hudson Cycling Club, Saratoga Stryders, Capital District Triathlon Club, Saratoga Rowing Club, Out of Control Ski Club, Saratoga Mountain Bike Association and many others. Many summer travel destinations will be present to share info and deals on visiting, activities, lodging, events and getaways – Erie Canalway, Hoppy Trails Brew Bus, Tupper Lake, Walkway Over the Hudson, and The Wild Center to name a few. Plus, a variety of kids’ summer camps for growth and adventure. On-water demos will take place all weekend in the pool, with kayaking, canoeing, paddleboarding, yoga and scuba diving. Demos and clinics, led by ADK and regional paddling experts: capsize recovery, rescue and rolling, pack canoeing – and the popular “Try Paddling” sessions for kids! A variety of seminars and clinics will be led by contributing writers, trainers, athletes and health professionals. Seminars include running, hiking, biking, triathlon, injury prevention and yoga. Damien’s Rock Wall will challenge kids and adults on the wall, and many exhibitors – including “putting on the green” with Capital Region Disc Golf and boxing with RAW Fitness– will have demos and activities all weekend. The Regional Food Bank of Northeastern NY and Ainsley’s Angels – Power to Push (meet Shaun Evans of Galway, who ran 3,200 miles in 60 days cross-country in 2015) will be on hand to collect donations over the weekend. Attendees who donate food or money to the Regional Food Bank will receive extra raffle tickets, which will increase their chances of winning Expo prizes! The Summer Expo takes place on Saturday-Sunday, March 5-6 at the Saratoga Springs City Center at 522 Broadway. Admission is $5 for the weekend, and ages 18-under are free. Hours are Saturday 10am-5pm and Sunday 10am-4pm. For an exhibitor list, seminar and pool schedules and parking map, visit AdkSports.com or call us at (518) 877-8788.